We know that a long-term, comprehensive approach is essential in ensuring that children born with cleft lip and palate can build happy, healthy lives. At Transforming Faces, we work with local teams to provide care that begins when babies are born, and continues for up to the first 20 years of a patient’s life. While surgery can be an important part of the treatment process, our partners know that comprehensive cleft care often begins well before the initial cleft repair surgery. Chaiyanon’s cleft treatment journey is just beginning. His family live in Thailand’s northernmost town of Mae Sai (right on the Myanmar border), and they welcomed their beautiful baby boy into the world this past December. 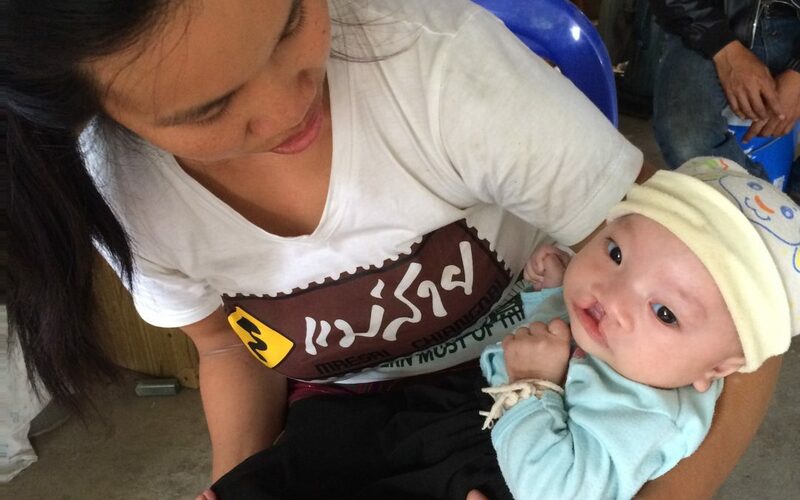 When Chaiyanon was born with a cleft lip and palate, his family knew to seek out our Thai partner, the Northern Women’s Development Foundation (NWDF). They brought Chaiyanon to our partner when he was just two days old, ensuring he has access to quality care from the very beginning. As is the case with many newborns born with cleft, his journey is not without its challenges. He is having some difficulty gaining weight – which is important in ensuring there are no delays to his repair surgery. His parents are invested in his recovery, and are grateful to have access to free, quality care for their son as work can be scarce, and his father cleans gutters when he can for around $20 CAD a day. But with the support of his loving family and our network of partners in Thailand, he is off to a strong start! He will have an assessment later in the month to determine whether he is a good candidate for NAM treatment, which is used to help reshape the nose, gums and lips before surgery for better outcomes. And while Chaiyanon’s cleft care journey is just getting started, we are very happy to know that both he and his family will have access to long-term support in the years ahead!